LOBSTAAA!! 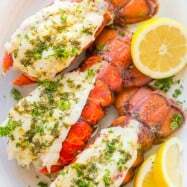 Broiled lobster tails are easier than you think and take only 10 minutes in the oven. Watch the video tutorial and learn how to butterfly and prepare some seriously delicious lobster tails. 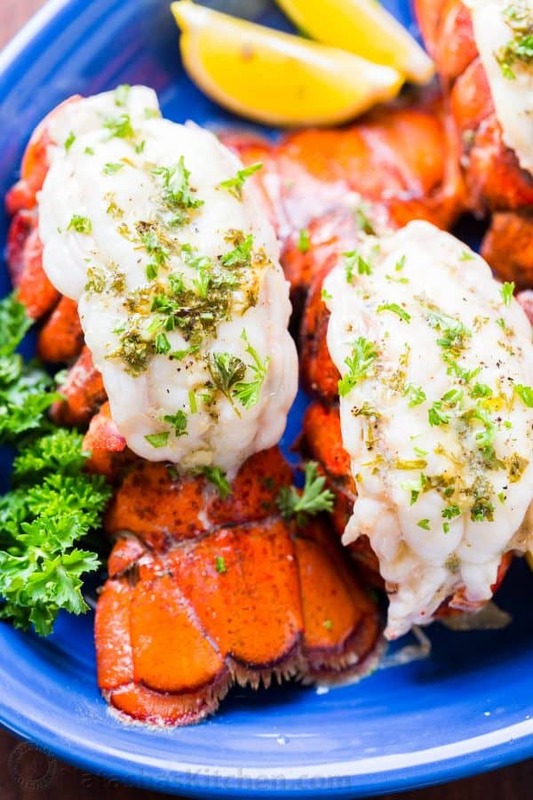 Broiled lobster meat is crazy tender, juicy and every bite is bursting with fresh lemon butter flavor. That lemon butter lobster sauce is tantalizingly good. 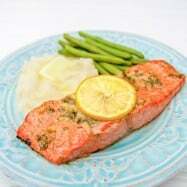 We used it on our most popular salmon recipe that won the heart of the internet a few years ago and for good reason. 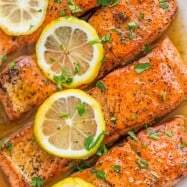 Many of you have shared that it’s the only way you make salmon now (which makes my heart go pitter pat). 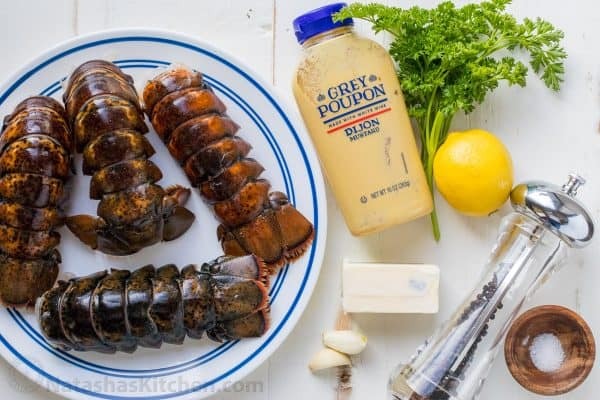 If you love lobster, I hope this becomes your new favorite way to make Lobster tails. P.S. Read about the “Labor of Love” party that my son’s class is doing at the bottom of this post. So SWEET!! They look and taste like restaurant quality lobster tails. It is an elegant and romantic dinner idea (think Valentines Day!). P.S. 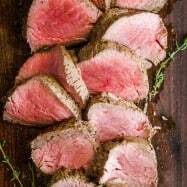 before Valentines Day, lobster tails tend to go on sale along with filet mignon so keep an eye out for that at your local grocery store. I spotted lobster tails for $5 each in Fred Meyers yesterday. 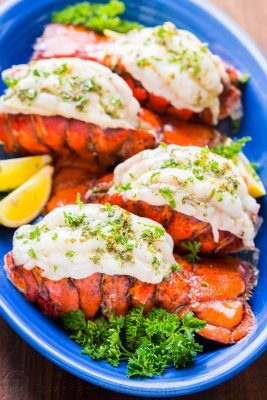 We originally posted this lobster tails recipe exactly 1 year ago and it has 21 FIVE STAR reviews which is amazing. Read some of the glowing reviews and you’ll realize quickly this is a winner! Lobster can be intimidating so we decided to make a video tutorial for folks to realize just how easy it is! P.S. We’ve included our Amazon affiliate links below for the tools we love. Broiled the Lobster tails in this casserole dish. Checked for doneness with an instant read thermometer. Plated it on this gorgeous blue serving platter. HUBBA HUBBA!! Is your mouth watering yet? Broiled lobster meat is crazy tender, juicy and every bite is bursting with fresh lemon butter flavor. Don't skip that garlic lemon butter to serve. 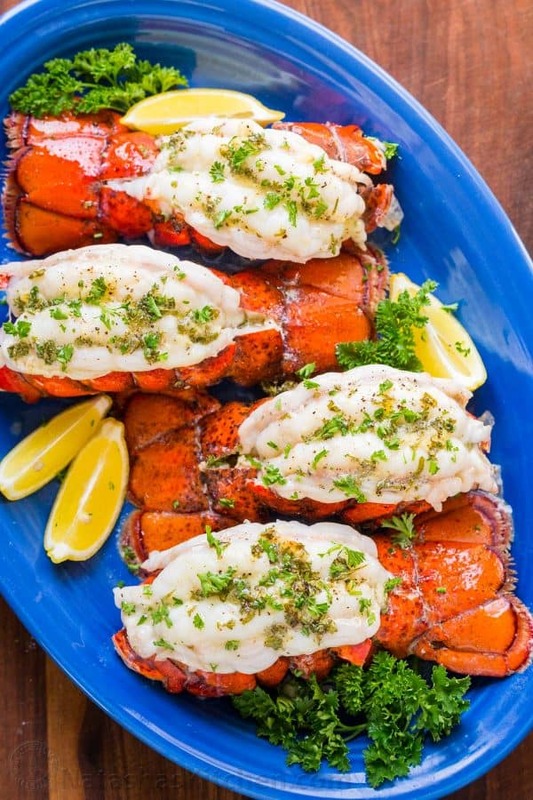 Place lobster tails shell-side up with the tail end away from you. Cut through the top of the shell Snipping through the shell and top portion of the meat as you go. Stop at the base of the tail. Flip the tail over to the see-through side and crack the ribs using both thumbs down the center. This helps open the shell. Remove and discard the vein if you see one. Carefully run your thumbs down the sides of the meat to loosen it from the shell (CAREFUL! Those shells can be sharp!). Lift the meat from the shell, keeping it attached at the base then press the shell together underneath and set the lobster meat back over the top, opening up the meat to butterfly the tails. Butterfly remaining tails and transfer to a casserole dish. Preheat oven to Broil on high heat with rack in the center of the oven. Place the rack so the top meaty portion of the lobster tails is about 6" away from the top heating element. 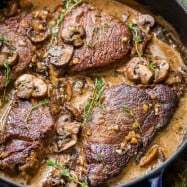 In a small mixing bowl, combine the marinade ingredients: 1 Tbsp parsley, 2 pressed garlic cloves, 1 tsp dijon mustard, 1/4 tsp salt, pinch black pepper, 1 1/2 Tbsp lemon juice and 1 1/2 Tbsp olive oil. Stir to combine then spoon it all over the lobster tails. Dot the top of lobster tails with 2 Tbsp of butter. 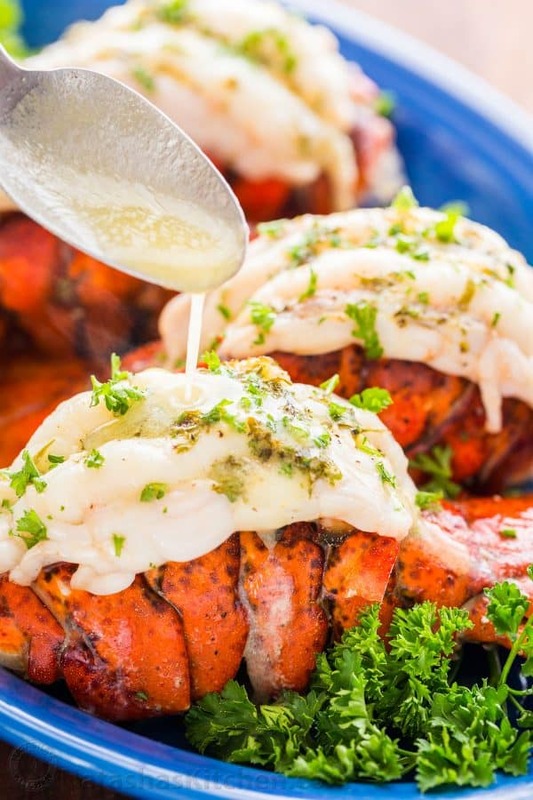 Arrange lobsters in a rimmed oven-safe casserole and place under the preheated oven broiler to broil 10-11 minutes or according to the lobster tail size chart below. The finished lobster should be white and opaque in the center and register at least 145˚F on an instant read thermometer. As soon as lobster tails come out of the oven, transfer to a serving platter. Pour drippings from the pan into a small saucepan over medium heat. Melt in 2 Tbsp butter and remove from heat just as soon as the mixture starts simmering. Spoon the lobster butter sauce over the tails and serve. You can also serve the sauce in ramekins on the side for dipping. My son’s class is doing the most amazing project this year called the “Labor of Love Party” for Valentines Day. The class is collecting donated items that will go into a large ziploc bag (snacks, toiletries, cough drops, etc.) and they will package them for distribution to the homeless or hungry in our area. I’m so excited about this and what an amazing way to show love. I hope it inspires you like it does me! Great recipe on butterflying the tails. I brought 14 five ounce tails as a Christmas dinner appetizer. The butterflied tails’ presentation was beautiful. I decided to barbeque the tails, and they turned out perfectly. This looks delicious! Is the Dijon mustard or the garlic prominent at all? I want to make this for my family but my 4 year old really doesn’t like mustard or strong garlic flavor at all. What do you think? By the way, I love your website and think you all are doing such a wonderful job! 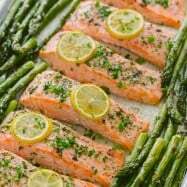 Great recipes and so awesome that it’s a family effort!